WASHINGTON—One in six Gen Xers purchased a multi-generational home, overtaking younger boomers as the generation most likely to do so; with 52% of those Gen X buyers indicating that they did so because their adult children have either moved back or never left home. 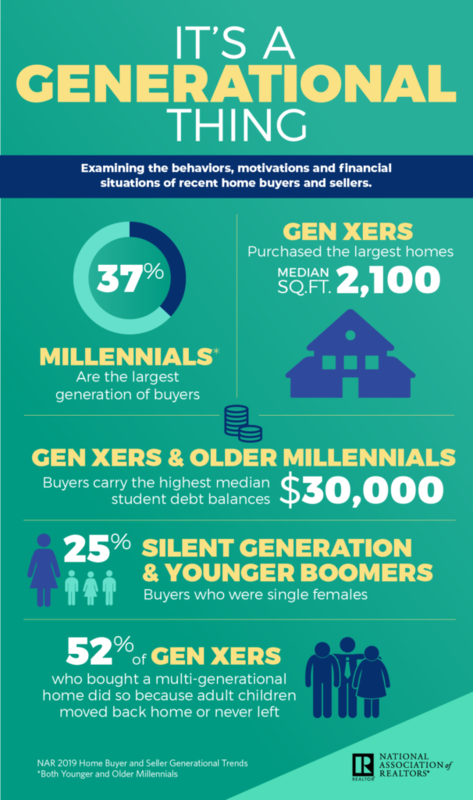 These and other interesting buying trends were part of the National Association of Realtors®’ 2019 Home Buyer and Seller Generational Trends study released on April 1. The study evaluates the generational differences of recent homebuyers and sellers. The report also found that older millennials who bought a multi-generational home, at 9%, were most likely to do so in order to take care of aging parents (33%), or to spend more time with those parents (30%). Millennials as a whole accounted for 37% of all buyers, making them the most active generation of buyers for the sixth consecutive year. 2019 is the first year the report separated younger and older millennials, accounting for 11% and 26% of buyers respectively. This separation was deemed necessary as younger millennials now account for a larger buying share than the silent generation (7%). Gen X buyers were the second largest group of buyers (24%), followed by younger boomers (18%) and older boomers (14%). Yun says this is to be expected as millennials continue to age and advance through various stages of their lives and careers. “Older millennials are now entering the prime earning stages of their careers, and the size and costs of homes they purchase reflect this. Their choices are falling more in line with their Gen X and boomer counterparts,” he said. Older millennials and Gen Xers carry the most substantial amount of student loan debt, with a median amount of $30,000. Younger millennials rank second with a median amount of $21,000. However, younger millennials are the most likely to have student loan debt, with 47% indicating that they carry some amount of student loan debt, while only 42% of older millennials and 27% of Gen Xers report student loan debt. Younger and older boomers also report carrying student loan debt but at a lower amount, 10 and 4% respectively. While the majority of buyers in all age groups are married couples, single buyers and unmarried couples continue to make a mark on the real estate market. Single females accounted for 25% of all younger boomers and silent generation buyers. “Many of these buyers are entering the market after a divorce, which is the case for younger boomers, or the death of a spouse in the case of those in the silent generation,” says Yun. While only 8% of buyers as a whole were unmarried couples, they accounted for 20% of all younger millennial homebuyers, compared to 13% for older millennials, 8% for Gen Xers, 4% for both younger and older boomers and 3% for the silent generation. Buyers and sellers across all age groups continue to seek the assistance of a real estate agent when buying and selling a home. At 92%, younger millennials were the most likely to purchase a home through a real estate agent. “Help understanding the buying process” was cited as the top benefit younger millennials said their agent provided (87%). Across all generations, 87% of all buyers purchased their home through a real estate agent. Gen Xers were the largest group of sellers, accounting for one-quarter of all sellers. They were also most likely to have wanted to sell earlier but could not because their home was worth less than their mortgage; 15% reported they were in this situation. Ninety-two percent of all sellers used an agent during their home selling process, with older millennials and Gen Xers were most likely to have used a full-service agent who offered a broad range of services and managed most aspects of the sale. NAR mailed a 129-question survey in July 2018 using a random sample weighted to be representative of sales on a geographic basis to 155,250 recent homebuyers. Respondents had the option to fill out the survey via hard copy or online; the online survey was available in English and Spanish. A total of 7,191 responses were received from primary residence buyers. After accounting for undeliverable questionnaires, the survey had an adjusted response rate of 5.6%. The sample at the 95% confidence level has a confidence interval of plus-or-minus 1.10%. The recent homebuyers had to have purchased a home between July 2017 and June 2018. All information is characteristic of the 12-month period ending in June 2018 with the exception of income data, which are for 2017. Survey generational breakdowns: Younger millennials (ages 21-28); Older millennials (ages 29-38); Gen Xers (ages 39-53); Younger boomers (ages 54-63); Older boomers (ages 64-72); and the silent generation (ages 73-93).